CrossFit defines fitness as increased work capacity across all these domains. CrossFit's program achieves this by provoking neurological and hormonal adaptations across all metabolic pathways. CrossFit athletes run, row, jump rope, climb rope, and carry odd objects. They frequently move large loads quickly over long distances, and use power lifting and Olympic weight-lifting techniques. CrossFit athletes also use dumbbells, gymnastic rings, pull-up bars, kettle bells and many body weight exercises. CrossFit is the fastest growing fitness method in the world. We went from 1400 affiliates in 2010 to more than 3000 in 2011. CrossFit is used by many office workers, parents, and hobbyists who want to get in shape. However CrossFit is also used by current world champion fighters, professional football players, rugby players, police, fire fighters, navy SEALS, and many more. All workouts can be scaled to anyone’s abilities, and can be applied to any level of fitness. Join us to find out how your life can change. 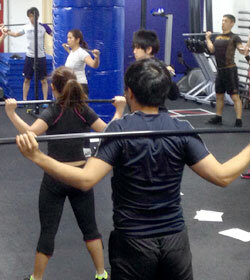 At CrossFit Daikanyama your health matters, and we are dedicated to “Forging Elite Fitness” in all of our athletes. This means you. Don't just take our word for it - watch this amazing video: Courtesy of CrossFit Inc.
As our introductory program, On-Ramp classes focus on basic movement mechanics and mobility as well as barbell, kettlebell, and gymnastics techniques so that you can maximize your time and effectiveness in the gym. Participation in a minimum of 8 classes is required to advance to our regular CrossFit classes. 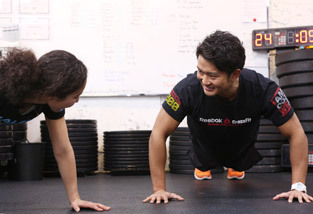 CrossFit KIDS is a fun and exciting program designed especially for kids & we're happy to bring it to Daikanyama. In KIDS, they will learn proper form and mechanics in both movements found in everyday life and challenging athletic movements. Fun and participation are at the heart of each class. Children of all athletic abilities will develop a love of fitness and enjoyment of movement for a lifetime!! ・Develop a well-rounded physical capacity in a fun environment! 1. Available trial lesson times are Thursdays 16:30 and Saturdays 15:00. 2. Children must be accompanied by a parent/guardian at registration and pick-up, although you are encouraged to watch. 3. A waiver, signed by a parent or guardian, is required for each child before he or she is allowed to participate in a class. 4. Ensure your children are wearing clothes appropriate for running, jumping, swinging, climbing, and being upside down. 5. Ensure your child has a bottle of water, or a bottle that can be filled up at the water server. Don't forget to put your child's name on it! 6. Taking pictures during class is permitted, however we ask that you refrain from posting images of children other than your own on any social media without prior permission from their parent/legal guardian. 7. Please make the coach aware of any special needs for your children that may facilitate their individual safety, learning, and growth (i.e., medications, illness, physical/mental limitations, injury, sports, etc. ).